I have three kids. Sometimes they’re all very similar – like when all of them cry at once because I turn off the TV or when they all beg for a second advent calendar sweet. And sometimes they’re all quite different. 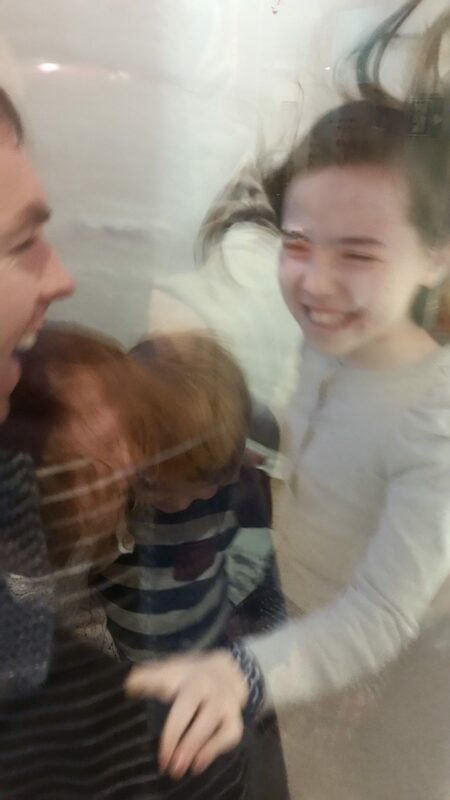 On Sunday, at a Santa Science Lab in Imaginosity, I had the different kids. The first was Enthusiastic Hand Raiser – a big science fan who wants to answer every question; I got a sense of what she must be like in school. The second was Wait-and-See Girl; she needed convincing. She had one eyebrow up and there was a bit of a shrug going on. She wasn’t going to run into this with open arms or raised hands – the demonstrator was going to have to win her over. The third was Selective Hearing Boy. Requests like “no, don’t touch the green stuff” and “put down the stick” and “keep the lab coat on” were completely ignored in a manner I wish I could emulate at home when all the kids want something from me. 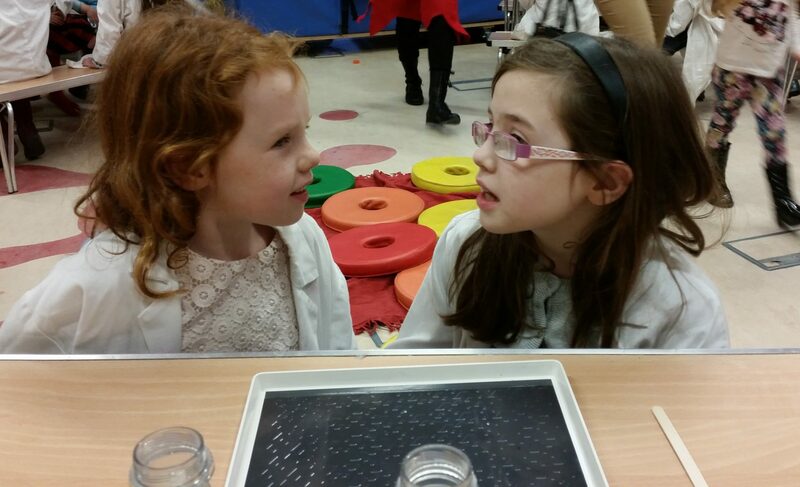 We had been in Imaginosity for half an hour when we got the call to go to the Science Workshop. The kids raced to line up for lab coats, excited about science, and really, just excited, as kids always are when they have to line up for something new. They were led into the room and invited to sit on the floor on front of the demonstrator. Grown-ups lined the walls and benches, babies in arms and phones in hand, poised to snap the best bits. 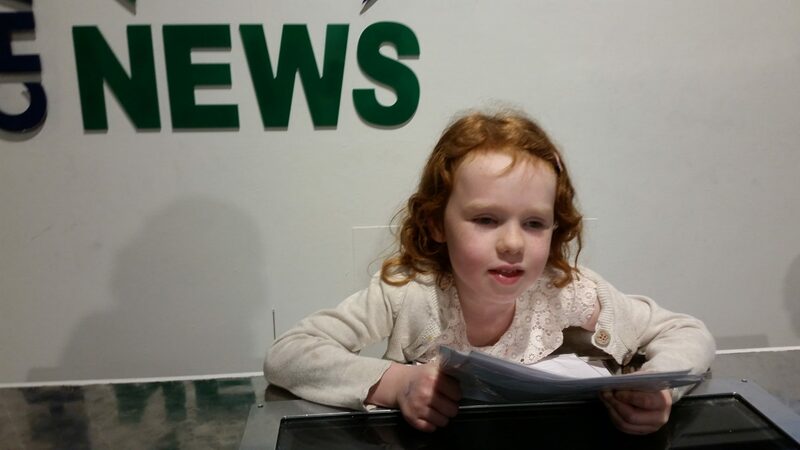 The demonstrator explained what she would be doing, asking the children to guess the answers throughout – they were an enthusiastic bunch of kids, with a wide variety of gorgeous answers to every question asked. 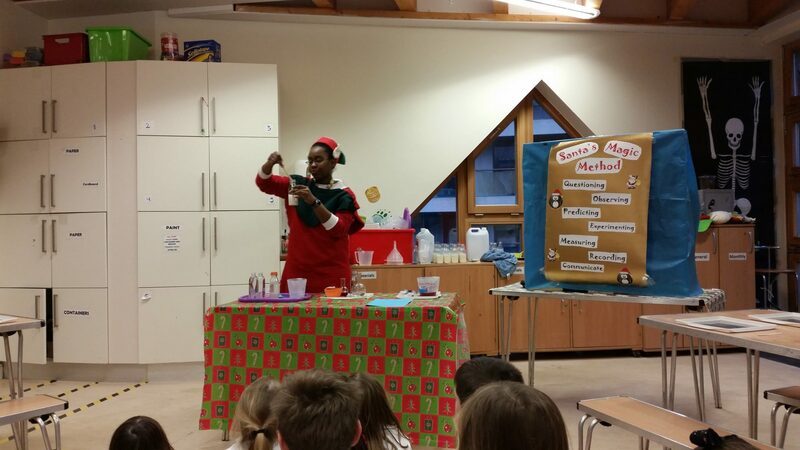 There was a Christmas theme throughout, and the experiments included making snow in a bottle and reindeer toothpaste. I watched as my Enthusiastic Hand Raiser volunteered answers for every question, listening intently and taking it all in. Wait-and-See girl was a study. In spite of her initial uncertainty, her hand started to go up too, and her furtive glances back to me grew less frequent. Eventually she was laughing along with everyone else and volunteering to help with experiments. Selective Hearing Boy however was a lost cause. He wandered back to me, took off his lab coat, lamented that he hadn’t been picked to help the demonstrator, and tried to do his own experiment with some green stuff in a cup on a nearby table. I gave my husband the “it’s time to take him out but not in a mafia way” look that we’ve perfected over the years, and off they went – back out to the joys of Imaginosity, three-year-old style. Meanwhile, the children in the workshop were invited to sit at tables and try an experiment themselves – they each poured milk into a tray, then squirted red food colouring from a syringe, then dipped a lolly stick in washing up liquid and put it into the tray, to see how the dyed milk was repelled. My two girls loved it and were delighted when it worked – there was help on hand from staff but they were happy to do it themselves. 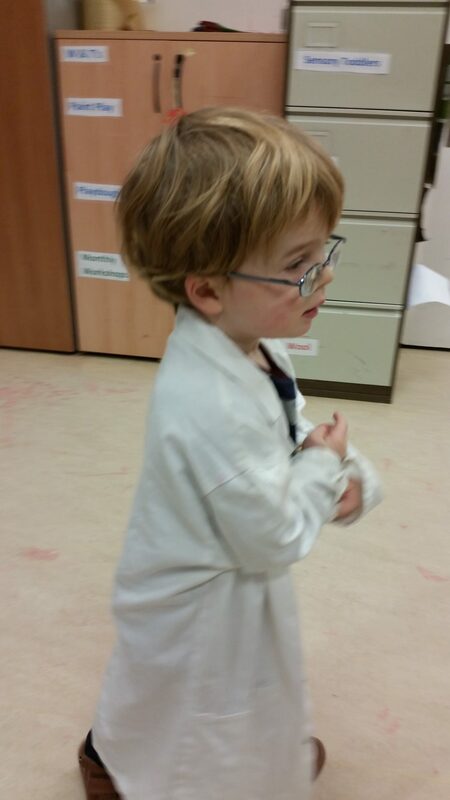 Then it was time to hand back the lab coats and get back to the serious task of playing. 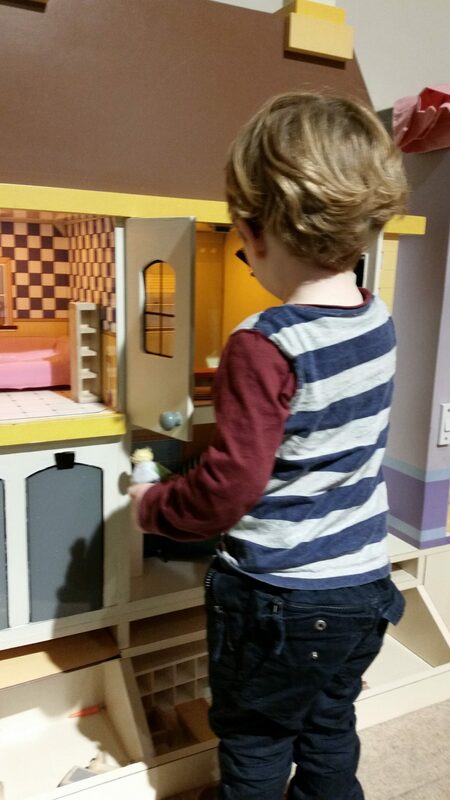 It’s a couple of years since we’ve been to Imaginosity, and Selective Hearing Boy doesn’t remember it at all, so it was lovely watching him discover the shop and the doll’s house and the car and the building blocks. The girls zipped over and back, up and down the stairs, delighted to have some freedom while we trailed after the small boy. They layout is perfect for kids who want to explore safely and parents who want to give some freedom but to know that there’s only so far the kids can go. But the top favourite out-of-this-world most amazing thing ever that the small boy loved, loved, loved was being part of an interactive computer game. I hadn’t seen this before, but basically, the kids stood against a green backdrop – a bit like a ground-level stage – and then watched themselves on screen taking part in a computer game. They had to catch golden rings (or something) and they could shoot fireballs (or something) from their hands. It was pretty impressive. 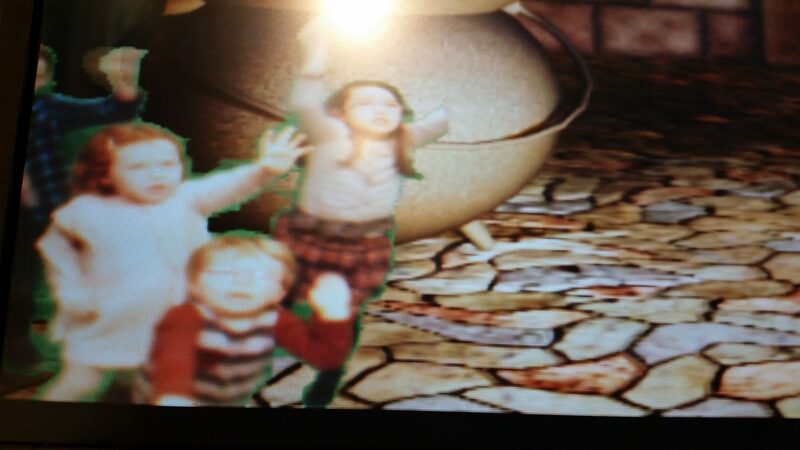 The three kids spent a good twenty minutes there, completely unselfconsciously throwing themselves around the stage to take part in the game, enthralled by the screen and oblivious to everything else. All too soon, our two hour slot was up, and we headed back out into the Sunday evening fog, lit up by twinkly Christmas tree lights. Enthusiastic Hand Raiser, Wait-and-See Girl, and Selective Hearing Boy were unanimous again. They’d had a ball. 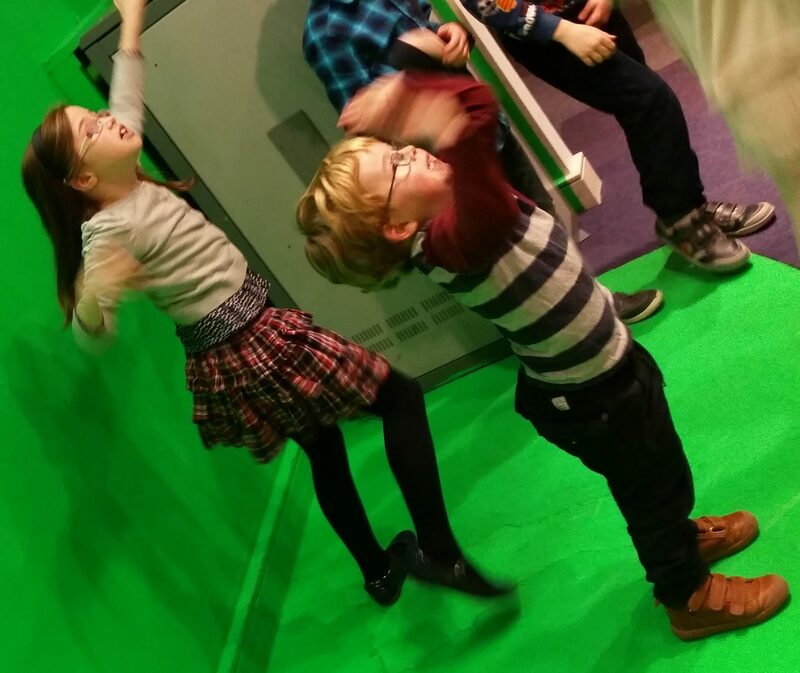 We were invited to Imaginosity to check out the Santa Science Lab but what’s really good is that the Santa Lab and all the other events are at no extra cost – you just go along to whichever one is taking place during your normal visit, and it’s covered by your normal entrance fee. You can find a full calendar of events here – including Christmas story-time, Science Labs, Winter Wonderland crafts, Christmas Tree art, and loads more. The workshop schedule is updated monthly and the team at Imaginosity run various seasonal themed workshops, combining seasonality with fun learning experiences for the children. January is Mary Poppins month! The only supplement ever charged is to see Santa, who will be there on December 19th – the trip to see Santa is an optional extra on Saturday, so those wishing to come in for a play are not tied into that if they just want to visit the museum!